We are happy to welcome you to the internet home of InDiago. 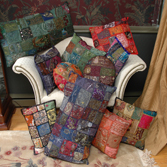 InDiago is a wholesale outlet for hand crafted, decorative home and womens' fabric accessories. Most items are created from vintage Indian ceremonial gowns. These materials are pieced together and beaded by three generations of our manufacturer's family. They are truly unique and beautiful. We offer the finest quality hand crafted products at affordable prices with new products being introduced several times a year. Indiago is the sole supplier of these products in the United States. Our trade business promotes jobs in areas of India that will help turn the tide against poverty. We are proud of the products we sell and of the environment in which they are manufactured. We are sure your customers will enjoy their beauty for years to come. all content copyright ©2017 Vanro, LLC.